Whereas human males may resort to sweat lodges, fishing trips or men’s sheds to find gender-biased comfort and support, for one of our native bees the blokes simply find a branch and huddle. Nomia bees (Nomia sp), which featured in a previous post, belong to the halictid family of burrowing bees. They do sting but are not easily provoked. The female bees nest in the ground or in rotten wood, either by themselves or in a communal nest with other females, where they look after their own young and help guard the nest. The nests can be reusable. The females are much hairier than the males as they need to carry pollen to feed the young. The males do not nest. At the end of each day they will group together on a grass stem or branch. 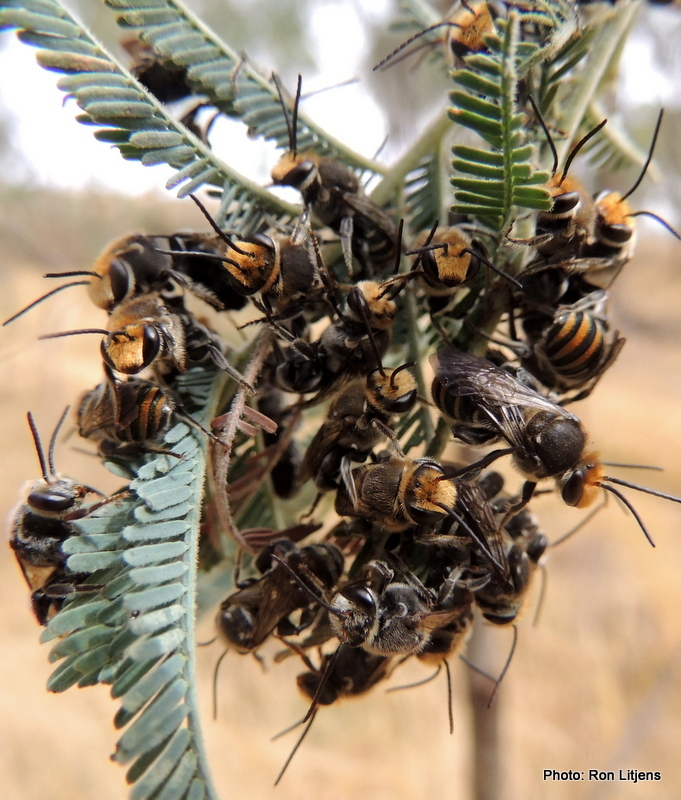 Pictured is a group of male Green and Gold Nomia Bees (Lipotriches australica) found on a Silver Wattle (Acacia dealbata) branch. During the day the bees leave this resting place only to return at dusk. Sort of like a plein air YMCA.